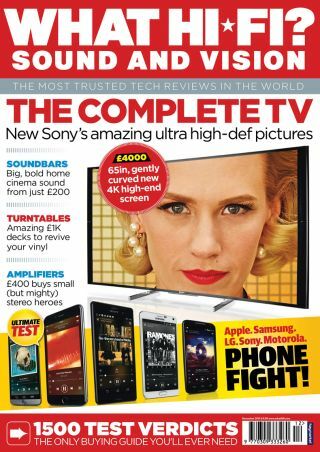 Sony gets ahead of the curve in our December 2014 issue – on sale now | What Hi-Fi? It might seem as if things are starting to wind down for the current year, but don't let that fool you into thinking we're done for 2014 – our December issue hits the shelves today [19th November] packed full of great features. And leading this month's What Hi-Fi? Sound and Vision line-up is the Sony KD-65S9005B – a 65in 4K screen that gets ahead of the curve with style and substance; it's arguably the complete TV, but we'll let you decide for yourselves. Of course, that's not all – with everything from amazing turntables to small-but-mighty amplifiers. With the festive period now starting to make its presence felt (no pun intended), you might even find some gift ideas. We all long for something to boost the sound of our TVs, but it's understandable that some of you don't want to pay through the nose for the pleasure. That's where budget soundbars come in. Despite the arrival of the soundbase, the ever-growing soundbar market has no intention of going away. We've taken eight affordable options and put them head-to-head in our Supertest to see which is the best you can get. The record renaissance continues in open defiance of the digital music revolution, and demand for high-quality spinners remains on an upward curve. Four amazing turntables that come in at the £1000 mark are put in the spotlight, but only one can come out on top. Elsewhere, we run our eyes over six sets of on-ear headphones under £250 to see which deserve your attention; we scrutinise five of 2014's best smartphones; and five radios with stylish looks and features aplenty are subjected to our expert ears - and eyes. Not that we're done yet, either. With the NAD D 3020 giving us a glimpse of the future for stereo amplifiers, these mighty machines - the heart of any hi-fi system - continue to evolve to reflect current trends. We use streaming services. We play music on our smartphones and laptops. And we want high-quality downloads. We have five amplifiers on test this month that do all these, and all but one costs a sensible £400 to ensure it'll be a tough contest. We haven't forgotten our trusty regulars, however. And our Temptations this month comprise the most ambitious Rega turntable we've ever tested and a pair of high-end stand-mounters from Roksan that could well grab the limelight. Insider takes a look back at the year in tech that was 2014 and showcases the five best new products launched since our last issue, while Playlist serves up this month's leading movies, music and games to test your system. It may still be mid-November, but you might just feel like Christmas has come early with the December 2014 issue of What Hi-Fi? Sound and Vision - now available from your local newsagent and, alternatively, as a digital copy online.